Today I’ve been doubly blessed having both Steve Wild (President of Conference) and Stephen Lindridge (Chair of District) travelling with me. What fun at Kibblesworth Messy family club this morning. A few years back this local church refurbished their premises to make it more flexible and it was wonderful to see how the space was being used for mission. 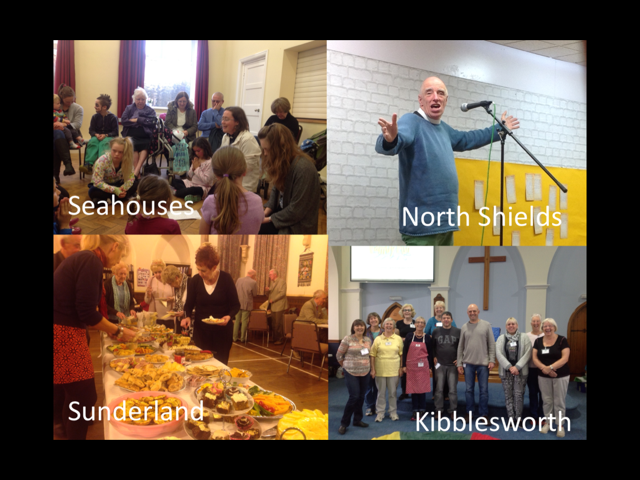 Please pray for the good folk of Kibblesworth as they look into the possibility of continuing their mission to the community with a regular Messy Church. Then over to the shop at North Shields. In the midst of all the noise and fun, there’s some remarkable stories of people coming and sharing with team members….sometimes about really difficult issues in their lives. At the back of the shop is a free standing wooden door with the words ‘I stand at the door and knock’ written on. 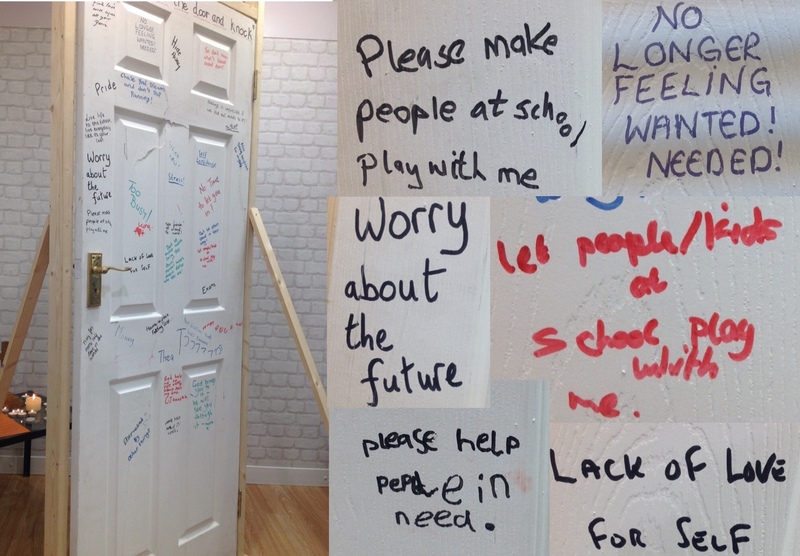 People are encouraged to write their prayers on the door then walk through it and light a candle and pray. I was very moved to read the prayers….particularly after chatting to one boy and then watching him write ‘God help me not to worry about seeing my dad’. Can I encourage you to look at the picture of the door below and take a moment to pray for the folk who have written these prayers. Then the three of us headed up to Seahouses to see their community exhibition. They’ve also been leading Messy Family club and it was great to see them all having so much fun with the songs. What was also amazing was how many people they managed to squash into the hall for afternoon tea! After tea Steve shared with them and encouraged people to follow Jesus….praise God for the person who came and took one of the crosses and gave their life to Christ. Final visit of the day was to St. John’s Sunderland for their community meal. Another amazing spread of food and a chance for Steve to again share the good news of God’s love. I can’t tell you how incredible it is everyday to be seeing ordinary, down to earth folk getting involved in the extraordinary mission of God.